Concerned about the costs of operating speed cameras to slow down drivers, the U.K.’s Norfolk City Council turned to a cheaper visual illusion courtesy of trees planted in the shape of a funnel. Another method was to plant trees “so that it looks like the environment is closing in on the driver”, he added. The road remains the same width but trees are planted on a “lazy diagonal” that gets narrower towards the entrance to the village. 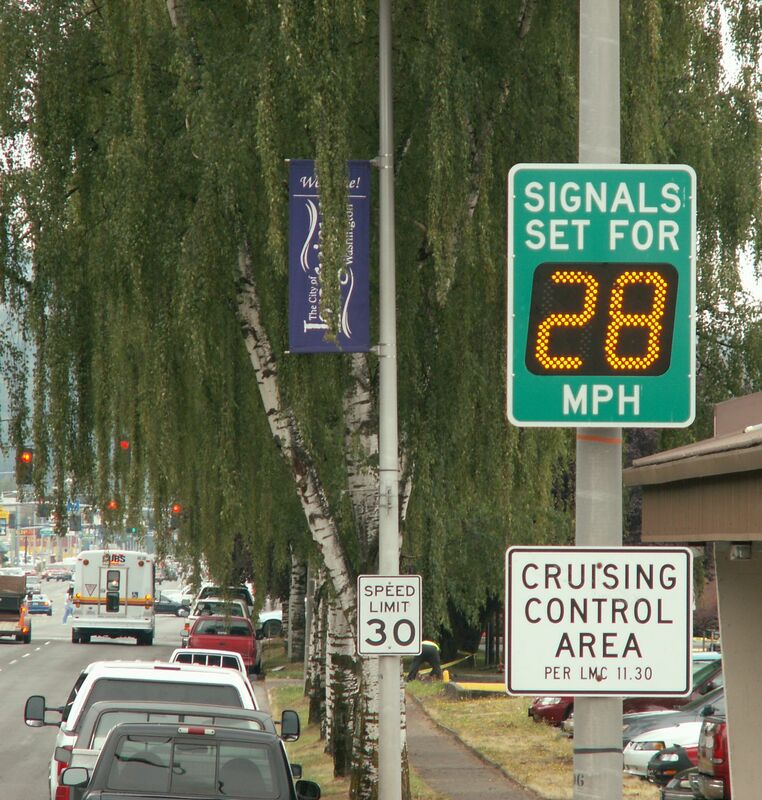 Preliminary results indicate speeds could be cut by 2-3 miles per hour. Keep in mind that the trees planted are still saplings. It could take as much as 10 years for full effects to be measured. The BBC has video of the trees. The city of West Vancouver, British Columbia thinks holograms of children will slow drivers down. It’s quite a long way from the LSD Illusion. One question: What children play in parking garages with a rubber ball? A neighbor, maybe, but not a garage. Tom Vanderbilt doesn’t like the idea on the grounds it might lead to people swerving instead of slowing down, and hitting other cars, objects, or, sadly, kids. Sounds like a legitimate possible unintended consequence. Hat tip: Karl Woll. Over at How We Drive, Tom Vanderbilt posts an interesting new form of traffic feedback in Gainesville, Florida. The (traffic) signs state “Gainesville drivers yielding to pedestrians” and list the percentage of drivers who yielded during the previous week and the record high percentage who yielded during the campaign. Last week’s 52-percent yield rate is the record, so far. In his latest Psychologist column, Vaughan Bell recounts a story from Bogota in 1995 of a newly elected mayor’s creative solution to dealing with snarled traffic. (The mayor) realised that the people of Bogotá were more concerned about social disapproval than traffic fines, and so hired mimes to playfully reproach drivers that crossed red lights, blocked junctions and ignored pedestrian crossings. One cannot police by mimes alone, and in a further measure to address driving behaviour, the mayor’s office brought in flashcards to allow social feedback. Each citizen was given a red card to signal to someone that their driving was poor and a white card to signal that the person who been particularly courteous or considerate. The reason the mimes and cards worked, Bell argues, is that people learn “collegiate behaviour by social feedback,” and that the best methods of such feedback offend us the least. One other advantage that this system has over, say a “How’s My Driving?” bumper sticker, is that the feedback is instant — although not cataloged for other drivers in an Ebay style feedback system. This advantage comes at the risk of prompting more road rage incidents in other countries. Still, giving someone a red card is kinder than flipping them the bird. Addendum: An online forum for calling out bad drivers. Rory Sutherland wonders about the virtues of traffic lights that tell drivers how many seconds until a green light turns red, or how many seconds until a red light turns green. They appear to be quite popular in China and Taiwan where according to a Freakonomics reader the green lights that count down to red lights increase accidents at intersections, while the red lights that count down to green lights cut them in half. Essentially, moving drivers try to rush through the intersection, while stopped drivers show more patience before speeding out into it. The photo below, from Chinese expat Stephen Cronin, is an example of the red lights that count down to a green. Rory dug up a bit more information about the lights and it seems they are mainly manufactured by Chinese companies, including Shenzhen Yuhong Electronics and Hepol Electric Enterprises. This likely explains why the Chinese have been the earliest and most widespread adopter of the lights, although they can be found on most continents by now. The best red light countdown design does not come from a Chinese engineer, but instead a Serbian, Damjan Stanković, creator of the Eko, a red light whose outer edge turns from red to black, shrinking the red circle until it turns to green. “When you think about it, you don’t need this information counted in seconds, you just need to see the speed of the progress bar to give you an estimate of the time,” Stanković told the Daily Mail. Humans have an intuitive sense of numbers, even when they aren’t looking at them. Addendum: Counting down to walk would be a good idea for pedestrians too. The curve at Lake Shore Drive and Oak Street in Chicago is a favorite nudge. The tight turn makes it one of the city’s most dangerous curves. To try and limit wrecks, in September 2006 the city painted a series of white lines perpendicular to traveling cars. The lines get progressively narrower as drivers approach the sharpest point of the curve, giving them the illusion of speeding up, and nudging them to tap their brakes. Exactly how effective have these lines been in preventing crashes? Until now, only anecdotal accounts have been available. What about a little hard data? According to an analysis conducted by city traffic engineers, there were 36 percent fewer crashes in the six months after the lines were painted compared to the same 6-month period the year before (September 2006 – March 2007 and September 2005 – March 2006). To see if it could make the road even safer, the city installed a series of overhead flashing beacons, yellow and black chevron alignment signs, and warning signs posting the reduced advisory speed limit. Again, accidents fell – 47 percent over a 6-month period (March 2007 – August 2007 and March 2006 – August 2006). Keep in mind that the post-six-month period effect included both the signs and the lines. How much more these calming signals will affect driving is unknown, but the city considers the numbers a sign of success. A drive between the North and South Sides is now safer and quicker for everyone. Hat tip: Chicago Department of Transportation for providing its data. Addendum: A video simulating the Lake Shore Drive effect can be found on the original amazon page for the hardcover edition of Nudge. Scroll down the page to see the “related media.” The Lake Shore Drive effect is in the second video, titled “Richard Thaler Explains the Nature of Nudges.” The key footage is about halfway through. At least 22 states that ban texting while driving offer some type of service that allows motorists to get information about traffic tie-ups, road conditions or emergencies via Twitter. Sadly, the Nudge blog’s home state of Illinois is one of them. Full story here. What if a speed limit sign told you the most efficient speed to drive? Econs don’t always drive the speed limit. They know that sometimes driving the limit (or over it) can get you stuck behind slower cars or always stopping and restarting at red lights. Gridlock guru Tom Vanderbilt recently came across something called the TrafficFlow Manager that tries to help Humans drive more like Econs. (It is) a driver alert display that works with traffic signal timing to alleviate traffic congestion. When mounted along a route with timed traffic signals, the display informs drivers that the lights are synchronized and lets them know the proper speed they must maintain in order to avoid having to stop for a red light. Traffic engineers already try to set lights to improve traffic flow patterns. This “smart” device links the lights to the signs. The sign’s manufacturer says this kind of synchronization reduces delays and saves fuel. Governing magazine reports on a traffic experiment by the Virginia Department of Transportation that uses zigzag markings on roadways to try and make motorists slow down for pedestrians. VDOT got the idea to experiment with the zigzags from the U.K., where they are used as no-parking areas in order to give pedestrians a clear line of sight prior to crossing, and in Australia where they are used to warn drivers to slow down due to crossings they may not be able to see.